Joachim Andersen may have renewed with Sampdoria, but Gazzetta dello Sport and others in Italy are making it very clear that doesn’t kill the idea of a transfer for the defender. Tottenham Hotspur have been the Premier League club most linked with Andersen in recent weeks and they get another mention from the Italian newspaper on Friday. Spurs are described as one of the ‘top European clubs’ who have set their sights on the Danish footballer, with Juventus, Inter Milan and Manchester United the other clubs getting a mention. Interest from Tottenham isn’t elaborated on much this time, and that could be because Gazzetta believe there’s an auction situation on the horizon. 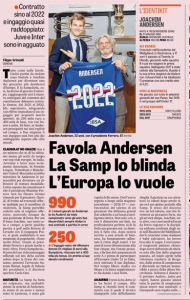 With Andersen’s new Sampdoria contract not containing a set fee transfer clause, the Genoa club can rub their hands together at the thought of an auction between big clubs. Depending on what levels the money would go to, that could see Mauricio Pochettino’s men stepping back from the idea and looking at other targets. The player’s progression for the rest of the season will undoubtedly play a big part.